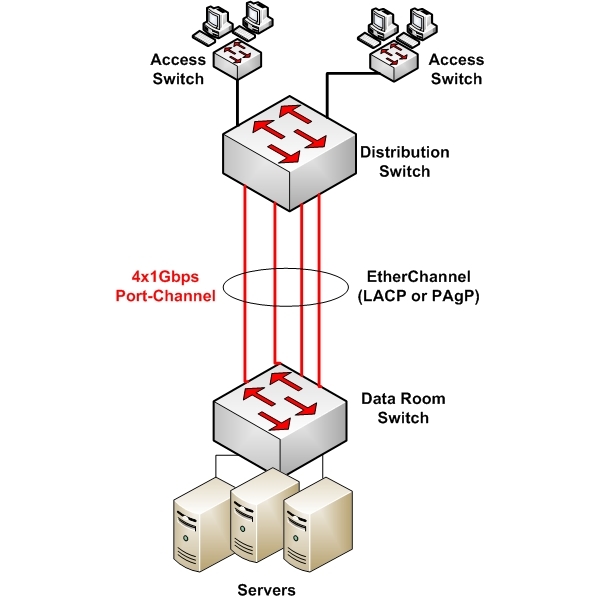 In this article we will describe how to configure both LACP and PAgP EtherChannels on Cisco switches. An EtherChannel is a Link Aggregation technology whereby two switches are connected together with multiple interfaces which are bundled together to form a single logical interface (“Port-Channel”) therefore increasing bandwidth between the switches. Assume we have a Data Room switch providing access to servers. This switch is connected to a Distribution switch which aggregates traffic from several user access switches. If we connect the two switches together with a single 1Gbps interface, then it could potentially be a bottleneck to traffic from users to servers (especially for high-volume applications). With Etherchannel, we can bundle together up to 8 interfaces to form a single logical link (Port-Channel) and traffic is load-balanced between all interfaces. In our example above, 4x1Gbps interfaces were bundled together thus forming a 4Gbps pipe from users to servers. This increases bandwidth but also enhances redundancy between the switches. If you connect the interfaces as shown above without configuring EtherChannel, then a Spanning-tree loop will be detected and 3 out of 4 links will be blocked by Spanning-Tree Protocol. By configuring Etherchannel, the bundle is considered as a single logical interface and there are no spanning tree loops. The first one (LACP) is preferred as it’s supported by many vendors and it’s a better protocol. Each protocol listed above has three modes of operation which dictate if the switch will actively seek to form an Etherchannel link or will wait for the other end to form the link. Switch 1 Mode Switch 2 Mode Channel Established? Assume physical interfaces Gi0/0 up to Gi0/3 will be used to form an Etherchannel. Moreover, it’s better to configure the resulting Port-Channel logical interface as Trunk in order to allow VLANs to pass between the switches. The first switch SW1 will be Active Mode and SW2 will be in Passive Mode. The first switch SW1 will be in Desirable Mode and SW2 will be in Auto Mode. Yes it will work also without trunk on the port-channel. The trunk is useful to pass vlans between switches. It doesn’t really matter. Especially for LACP I’m showing the same config for both switches so SW1 and SW2 can be either Distribution or Data Room. For PAgP its better to have the “desirable” command on the Data room switch so that you have more control.